It has been one year since that fateful afternoon when, at around 1pm, we fled our house to escape a bushfire which tore through our property and many hundreds of acres of land around us. One year! How absurd! As per the cliché that is often reported but never seems explicable, time has flashed past and yet it seems like just yesterday. So much has happened in the year since 17 February 2017, and still I can feel that afternoon in my bones, as if it happened moments ago... minus the sudden, gasping-for-air sobbing that kept randomly bursting out of me, thank goodness! When hubby and I were talking this morning about how I might write about the past year on The Tree Diaries, we broke it up into what we have done well / what we still want to do / what we've done badly. The conversation got stuck on our failures and all the things we should have done better, sooner, more professionally. It was more than a little disheartening. I have decided not to include those thoughts here. Yes, absolutely, we have "failed" in many ways in this past year. BUT - and it's a justifiably big BUT - we have come a long way in the past 12 months, and I genuinely think we should be chuffed with our efforts, no matter the shortfall. Our house is back to being fully functional (which took a full 11 months, and ours didn't even burn down! ), and our garden is looking really rather lovely. Different, to be sure, but quite lovely. All in all, things are pretty great. The photos I have included in this post perhaps don't do it justice, being high (horrible) summer and all, but I've done my best to capture where the garden is at in this moment in time. Since I last wrote about it on here, several trees we thought had survived ended up dying and had to be removed - including, sadly, almost all of the ornamental pear trees. Amazingly, six trees we thought were dead actually recovered. They had to be pruned back to just above the graft in some cases, but we decided that if their roots were strong enough to survive a bushfire, it didn't matter what shape they ultimately took, shrubby or not. These included two birch trees, a gleditsia, a liquid amber and a tulip tree (which is a sad specimen at only around 20cm tall!). However the most significant of these surprise survivors was our claret ash. I can't even begin to explain our joy in that! The claret ash on our top terrace has been a treasured marker of time and experience in our garden. It was originally planted outside the fence line in our (ridiculous, in hindsight) attempt to plant trees all around the property with no way to water them. It received a lot of love from me and my watering can, but ultimately it was clearly doomed and I pulled it out and potted it up. We managed to keep it alive for another year like that, barely, until we finished landscaping and put it in the first garden bed we made. It was virtually ringbarked by kangaroos, it was straggly and tiny... and within the year it became the focal point of the garden! After the fire it seemed unlikely to recover, but we kept water up to it and fertilised it heavily on the advice of a family friend. Come spring it was showing signs of life, so we cut it back hard, allowing every bud plenty of room to grow. The plan worked and that ash is once again the focal point of the garden. I still have to pinch myself every time I look out and see it there - the perfect symbol of resilience. Apart from the claret ash and some amazingly vigorous carpet roses, the whole top terrace is new. We decided early on in spring that we couldn't face tackling the whole garden this year, so we focussed our efforts on the top terrace and the back-front garden, the only part of the garden to have survived thanks to air waterbombing. We have invested a lot of time and money into those spaces, including making the fairly risky decision to buy a few advanced trees in the hope of getting instant shade and boosting our spirits. So far it has been a good gamble, and we have no regrets about investing into these spaces to make living here more bearable in the face of scorched everything. We haven't rebuilt the cubby house (which was hidden in the maple grove), but last autumn we built the kids a small sandpit next to the new-and-huge trampoline, and have slowly built a brand new garden space around that. It is now one of our favourite parts of the garden, where it used to be dry and neglected. In truth, everything else has been more or less ignored, or our half-hearted efforts have been largely unsuccessful. Sadly that includes our attempt to replant a smaller version of the maple grove but, as I mentioned earlier, this is not going to be a place to dwell on our failures, so let's not go there! The Coopermarket (vege garden) has been part of our 'ignore-for-now' plan. The garden beds are rebuilt, but we haven't yet refitted the plumbing into that part of the garden and the whole large space remains empty. We intend to get to that this autumn (I hope! ), and the kids and I have already started making plans for a small winter crop of veges. We are all still missing the chooks too, so a priority for the coming year is to rebuild the Taj Ma Fowl - the most epic of hubby's creations - and get some more feathery friends to share our garden with. The orchard is similarly absent. A dear friend of mine popped round with a few fruit trees in the weeks after the fire, and we planted them and have enjoyed watching them grow since, but haven't made any plans to plant more at this stage. I suspect we will actually one day replant an orchard within The Coopermarket instead of the main garden, but it is not currently on our priority list. My personal pet project for the past year has been to try to fill our garden with flowers and, by extension, insects and birds. My bee hives were destroyed in the fire and we haven't seen many foraging bees in the garden this year, unsurprisingly. But we have had an epic butterfly and bird year! I have become completely obsessed with sightings of winged friends - I even take notes of sighting dates and locations: #twitcher ! Just yesterday I saw the first supurb blue fairy wren outside my bedroom and I think I squealed! We had a swallowtail butterfly the size of a tea saucer around for a few days, although it was much too flittery for me to capture on film. I did catch some shots of our first scarlet jezebel butterfly on the fading buddleia though. It has been a total joy to see life come back to our garden, slowly but surely. Anyhoo, I'm sure I could go into much more detail about what we have and haven't done in the twelve months since that awful afternoon, but I think my time would be better spent getting out into the garden and being optimistic about the year ahead. It seems inevitable that we will experience another bushfire here one day - part and parcel of making a home in the Aussie bush - but I am desperately hoping that we can get another decade or two of gardening and growing time in before it happens, in the hope that much more survives next go-round. I spent a few hours in the garden with my littlest the other day, tidying up the area outside his bedroom and getting it ready to replant. Unsurprisingly, we mostly pulled out dead things (well, he pretended to chainsaw them down with a stick, you know, “helping”) but, happily, there are soooooo many bulbs popping up all over that garden bed. This has been such a welcome surprise! Who knew they would survive?! The day after the fire, when we were allowed to reenter our property, my husband rushed around trying to replace some piping, isolate destroyed water tanks and do other vital things, whilst I fruitlessly tried to put out the fires still burning around the house with random, spoiled liquids from the fridge. After experiencing the initial overwhelming relief of finding we still had a house, I couldn’t get over the fact that everything around the house was still on fire. Every single garden bed was burning, a full 24 hours after the fire had hit. It was scary (could we leave our house overnight, which we had to do, and still find it there the next day?) and it was deeply distressing - I mean, flames were licking the windows of my kids’ rooms and it made me mama-fierce. The amazing fire fighters who kept showing up to put out spot fires throughout the day reassured us that the house wouldn’t burn down - they were going to be there all through the night too and this was possibly the most protected our house would ever be - but that the fires around the house would likely keep burning for a day or two longer. The fire gets into the mulch (grrrrr mulch - a post for another day, but suffice to say we have completely changed our mulching plan from here on out) and then deep in the soil. Gosh this shocked me - I truly never knew that bushfires can keep burning long, long after the front has passed over. I mean, of course it makes sense, but I had never considered it before. Anyhoo, the upshot was that the garden beds were burning for about 48 hours and I didn’t think a single plant could survive that. And while most things did indeed die, some plants (like those bulbs outside my son’s bedroom) SURVIVED! I thought it might be useful to share the things that are still alive and the things that we hold out hope for over the spring, in case you live in a vulnerable area and want to think about what might be best in your garden. 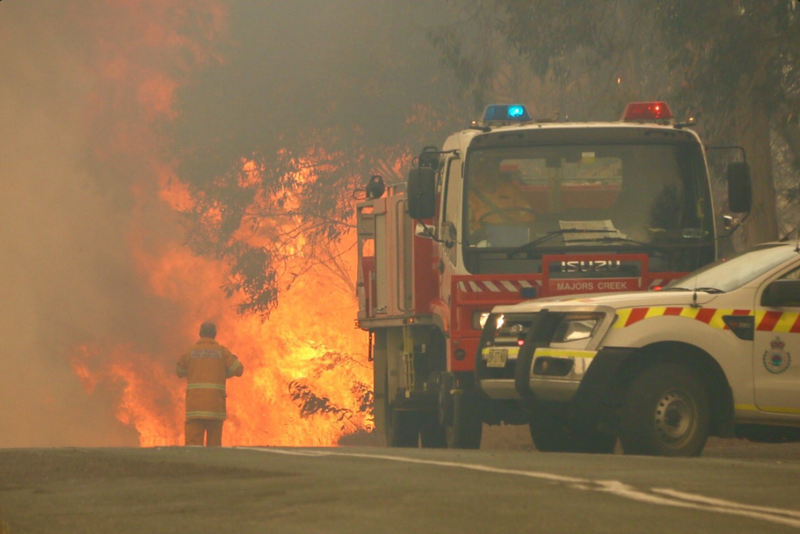 There are many amazing resources online (I'll link some at the end of this post) which provide well-researched advice to maximise the chances of your home surviving a bushfire. These include studies and resources about fire retardant and fire resistant plants, and they are great guides. But I wanted to share our experience because the theory doesn't always marry up with what happens in reality. For example, the flammability of plants is determined in lab conditions, using either fresh samples or oven-dried samples. Oven-dried is probably the most relevant because high-risk fire days are usually characterised by baking temperatures and the fire-front has so much heat ahead of it that anything which was fresh, or even freshly watered, is neither of those things by the time the fire hits. Certainly, some plants are far more flammable than others and really shouldn't be planted near your home, but realistically, all plants, even the fire retardant or resistant ones, are going to be potential fuel for a bushfire. Many of the plants listed in the expert advice were planted in our garden (because we had followed the advice!) and they didn't survive. Of course, had our garden been more established (with another decade or two of growing time before a bushfire), more may well have survived. And certainly, we are still very glad we had those plants in the garden - many of them probably had a protective factor for the house. I just make note of this because "fire retardant or resistant" does not mean you will still have a garden to return to after a bushfire. Ornamental pear trees - very few of our trees survived, and this is perhaps the saddest part of losing the garden. But what I found quite interesting is that even in parts of the garden where almost nothing survived, one or two ornamental pears look like they might be okay (time will tell for sure). They certainly didn't all make it - some burst into bud or blossom in a last-ditch attempt at life in the month after the fire and then promptly gave up - but a few look like they will be okay. Yay! Bulbs of all sorts - most of the bulbs that were at least 2 inches below the ground seem to have survived. In fact, some were thrown into an early spring and burst into life in the months after the fire (presumably because of the sudden increase in soil temperatures? ), so they did suffer a bit through the first part of winter. Despite that, I’d say that about half of the bulbs we had before the fire seem to have popped up in the last month or so. Hellebores - to be fair, at the tail end of summer the hellebores were mostly bare so there wasn’t much surface area to burn but, unlike the bulbs, they were still above ground. Yet even in garden beds that were alight a day later, many of the hellebores survived and are now in flower. They are bringing me so much joy this spring! May bush - I have been amazed by how many May bushes survived - four are alive, about the same number dead. A month or so after the fire, I cut the surviving ones back almost to the ground, so they are all a fraction of the size they were, but I have a feeling that they will make a great comeback this spring. Carpet roses - in one of our terrace beds, the carpet roses at both ends have survived - and flowered again recently! They were so badly burned that we truly didn’t think they would come back at all, but a super heavy pruning did them the world of good. Other carpet roses around the garden weren’t so lucky. Sadly, not one of my beautiful old species roses survived. I’ll have to hunt around for some more in the coming years. Lilacs - almost all of them survived and not one of them was a huge, established plant. I have been so impressed with the survival rate of the lilacs, and so grateful that some of them look like they are about to flower - I'm definitely going to be including more in our replanting! Irises - goodness these recovered quickly! Almost all the irises started reshooting within weeks of the fire and have seemingly happily kept growing throughout the winter. Convolvulus - a few died, but many of them recovered and are already starting to flower. The lawns - I have made note of this in an earlier post, but the lawns have all recovered in varying degrees and almost certainly made the difference between a defendable house and a destroyed one. Everything that was directly water bombed - our house and shed were both water bombed, and there is one section of garden on the south east side of the house that didn't burn as a result of that water hit. Some plants in that area died from radiant heat exposure, but everything else survived including (we are fairly certain - tbc) the 6 lovely Robinia psuedoacacia mop tops just outside the laundry - yay! The maple grove - we had put loads of love (and money) into our maple grove. It was a large area directly in front of the verandah, on the west side of the house, which was the direction of the fire front when it hit our place. None of the trees were more than 5 years old, so we aren't talking about huge 10m specimens which may have had a better chance of surviving, but all of them were characterised as "fire resistant". Whilst not one maple survived we are fairly certain that its presence is part of the reason we still have a house. The kids' cubby house was in the middle of the grove and it was non-existent after the fire, just a small pile of dust, one piece of tin and some screws remained. And yet about a dozen of the maples were still in the ground, clearly dead, but not physically gone. The ones right below the verandah almost looked like they might recover (sadly none did). We think, although we aren't certain, that the fire resistant maples gave enough of a buffer for the firefighters who stood on the lawns and, eventually, the verandah to fight the fire. The fire investigators were very interested in the maple grove and took a lot of photos and notes about it, and I suspect that is why. Anyhoo, we will definitely be replanting the grove over the next few years, as time and money allow. The orchard - our very productive orchard was totally destroyed, which was heartbreaking. It was the first thing we planted when we moved here, and it provided us with so much delicious fruit in recent years. But like the maple grove, it was in the direct path of the fire and possibly helped to protect the house a little (fruit trees are considered to be fire resistant). We intend to plant a new orchard but this time we will include it in the Coopermarket so that it is easier and less inconvenient to net over the summer months. Our giant forest pansy - this loss is so sad, as we had such a huge, glorious tree outside the kids' rooms and it looked like it might recover for a while there. I suspect it was too damaged in its roots because the bed was burning for so long after the fire. We had a second smaller forest pansy on the other side of the house and it also died. Not the most resilient of trees (which we had always noticed in dryer times anyway - they need a LOT of coddling). Ornamental apricots, cherries and crab apples - none survived, even when they were planted directly next to an ornamental pear that did survive. They were all young, but so were the pears, so I suspect that they are just much more susceptible to burn and heat damage, particularly to their roots. All other trees and shrubs - including some well established fire resistant trees like Chinese pistachios, liquidambar and tulip trees, as well as camellias, roses, smoke bushes (ironic really! ), crepe myrtles and a few succulents (which are fire retardant, but evidently not in these conditions). I guess the heat and extended burning was just too much, which makes the fact that most of the ornamental pears survived the same exposure seem even more extraordinary. We know we are just so very lucky to have any garden left at all. Whilst it is devastating to lose much of our beautiful space that we've worked so hard on over the years, we have a lot to be grateful for. This is becoming more and more evident as spring progresses and things recover, even where we least expect them to. And, more than anything else, we survived and we still have our home. For that I will always, always be grateful. Apologies, I haven’t been here in a while. It’s not so much been through a lack of inspiration (although that has ebbed more than flowed of late), but because… well, what does one write about on a gardening blog when the garden is no more? I’d love to share some of the goings-on around Widgetopia without feeling overly restricted by the gardening genre of this blog… which isn’t to say that there will be a massive thematic departure on here - nature is my jam, after all - but I hope that the total lack of a garden of one’s own might not exclude me from writing here when inspiration does, sporadically, strike. Autumn passed in a perversely beautiful display at Widgetopia - who knew that the Australian bush could rival European forests for beautiful fall colours? I guess we found out the hard way, but it definitely can. Not much got done here in those autumn months, sadly. I always kind of understood on some level that natural disaster recovery efforts were slow and drawn out, but I now know that huge reserves of patience are required. And we are a few of the lucky* ones after this bushfire, so we have nothing but gratitude for anything getting done at all (*though perhaps “luckier ones” is a better phrase because I am so sick of being told that we are just sooooooooo lucky after all of this - pardon my annoyance, but GRRRRRRR!). Insurance is a wonderful thing, but goodness me, it does not move swiftly. At all. In fact, it is just this past fortnight that the insurance subcontractors have begun any work out here. In the meantime of course we have done what we can, but it’s funny how limited that work can be when insurance claims need to be settled first. So, here we are, mid-winter and things are on the go. Fences are being mended, garden beds are being rebuilt. The shed is due to be torn down, panel-by-panel, and reconstructed in-situ next week. Hopefully (please please!) replacement tanks are imminent. We are getting there with the larger structural things, and come spring hopefully we can start on the garden. If I’m honest, I’m really not looking forward to that process… I feel guilty saying that the garden is too much, but it is. Emotionally, physically… it just seems too big a task to undertake all over again. But motivation will hopefully return a little, and things tend to get done eventually around here even without huge reserves of inspiration, so hopefully that will happen in time with the garden too. I’ll leave it at that for now… sorry for being a bit glass-half-empty, but that’s the reality of things and I’d like this space to be truthful if nothing else. On a positive note, we have been loving watching the regrowth of the eucalypts on Widgetopia. It's stunning really, watching the leaves pop out all over the blackened trees. We potter around the property every day to see what's new. As a result, I’ve rekindled my (post-summer, seriously dwindling) love affair for our Aussie bush, and have fallen headlong down a rabbit hole of trying to really understand the native forest here. It's good and cup-filling-upeth. I will definitely have more to share on that front soon.